'Joan Didion: The Center Will Not Hold' Plays It As It Lays The documentary, directed by Didion's nephew, the actor Griffin Dunne, isn't particularly revelatory, but it captures the writer's dazzling life and persona — and her struggles with grief. 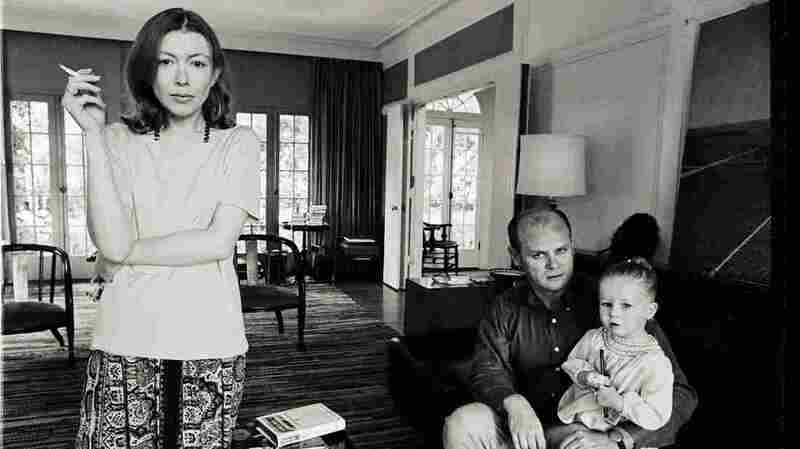 Joan Didion, John Gregory Dunne and their daughter, Quintana Roo Dunne, are the subject of the documentary Joan Didion: The Center Will Not Hold. Bethlehem be damned, Joan Didion is no slouch. Onscreen at age 82 in a new Netflix documentary about her life, the pioneering novelist and literary journalist is a flurry of activity in thick red lipstick, casting wide circles with her hands as she speaks. "I don't know what 'fall in love' means," she says near the beginning, in that precise diction. "It's not part of my ..." (gesturing toward something unseen) "... world." We likely would never have gotten Didion's world onscreen at all, had the makers of Joan Didion: The Center Will Not Hold been anybody other than her family (her nephew, the actor Griffin Dunne, directs while his cousin Annabelle Dunne produces). She was certainly in no mood to cooperate with Tracy Daugherty over a biography of her life published in 2015. Dunne doesn't tease out anything particularly revelatory, but that may be because his subject has already bled everything out onto the page for us. Now and forever, Didion is her author photo. In its assortment of archival images and interviews with coastal media types like Vogue's Anna Wintour and The New Yorker's Hilton Als, the film breezily captures the mythic allure of Didion's life. Every writer would kill to live as she did in the '60s and '70s: getting her start casually filling pages in Vogue; giving up New York for a grand mansion overlooking the Pacific; jetting off to file exotic, generation-defining cover stories for the top magazines; writing novels and screenplays when they suited her, as if on a whim; and maintaining an aura of celebrity so pronounced that she retroactively made Harrison Ford famous for working construction on her house before his big break. Think of the audacity it took to write a leaving-New-York essay called "Goodbye to All That," and the supernatural talent it took to convince readers that they, too, were waving goodbye to all that. This century, Didion has been defined not by what she's made, but by what she's lost. Her husband John Dunne died of a heart attack in 2003, and then her daughter Quintana battled two years of cascading illness before passing in 2005. This tsunami of sorrow produced the book and play The Year of Magical Thinking, a touchstone in grief manuals, and the follow-up Blue Nights. Out of every period in her life, the film is most effective at communicating the utter wreckage of this moment on Didion's soul. In front of the camera, Vanessa Redgrave, who starred in Magical Thinking on stage, visits Didion to go through old scrapbooks. She discovers a photo of her daughter Natasha Richardson, who died two years after the production and made Redgrave and Didion sisters in mourning. Dunne doesn't underline the moment. He simply presents it, a tiny little requiem. The fans will wish for more details of their queen's most famous pieces: tramping around with acid-washed children in Haight-Ashbury, interviewing members of the Manson family, plopping into El Salvador in the middle of the country's civil war. And the literati might have wanted to hear Didion expound a bit on the political and journalistic landscape of today. Does she think her longtime premonitions of societal collapse are finally coming true? How about thoughts on her many modern-day disciples in the blogosphere, the ones who have taken her authenticity and turned it into a kind of rhetorical currency where only the most soul-baring survive? Dunne seems to have an intuition about how far he can push his aunt on any given subject, and a natural protectiveness around her legacy. While that's as strong a sign of love as any, it gets in the way of a truly probing conversation. But it's hard to fully obscure the woman's tremendous accomplishments, and even seeing them presented in this straightforward way is nothing less than a treat. What an amazing thing, that Didion always seemed to be at the middle of every moment that mattered, with exactly the right words to match them.